Elijah James Smith was finally freed from Lewes prison on Wednesday 7th July. All of the decommissioners had been found unanimously not guilty last Friday, but James still had to apply for bail and is now tied to strict bail conditions, including not visiting Brighton. 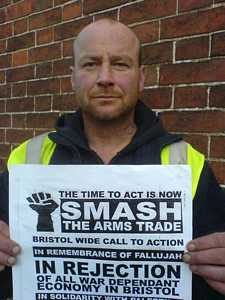 James has spent over 18 months on remand for preventing war crimes, he has endured more than most could even imagine and his commitment to peace and the end to the immoral trade in arms is impressive to say the least. This entry was posted on July 9, 2010 at 11:27 am	and is filed under EDO. You can follow any responses to this entry through the RSS 2.0 feed. You can leave a response, or trackback from your own site.